Il Prometeo satiresco di Eschilo: Pyrkaeus o Pyrphoros? titolo Il Prometeo satiresco di Eschilo: Pyrkaeus o Pyrphoros? The paper offers a survey of the surviving fragments of Aeschylus’ lost satyr-play Prometheus (staged in 472 BC), including those assigned to the play by conjecture. The analysis of the content (especially of the papyrus fragments grouped under nr. 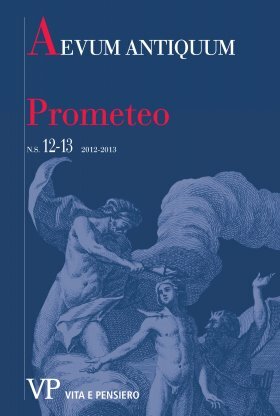 204 Radt) confirms the view that the drama focused on the theft of the fire by Prometheus; but probably aetiological elements, concerning the invention of the torch-race and the role and behaviour of the messengers, were also involved in the action. If so, they reflect perhaps impressive contemporary events of the Persian Wars, like extraordinary performances by running messengers as Phidippides or the beacon system used by Mardonius to deliver messages to the Great King across the Aegean Sea. The subtitle Pyrkaeus (Fire-Lighter) given by Pollux is not necessarily a mistake of the lexicographer (or his source) and may have been suggested by a particular scene of the drama, even if one accepts the identification of the play with the Pyrphoros (Fire-Bearer) listed in the Medicean Catalogue; at any rate, the possibility that the two plays were distinct and the latter was a tragedy cannot be ruled out.